The counter-affidavit was deposed to by a senior officer with the DSS, Mr. Ayo Ibitoye, who averred that it would be in the interest of justice, peace and order, to allow the IPOB leader to remain in custody of the security agency. ‎ The argument was however rejected by the high court ‎today. 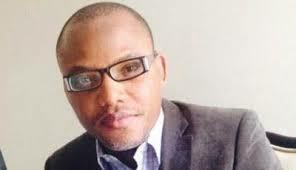 ‎It will be recalled Kanu who is also the Director of Radio Biafra and Television, ‎‎ was on October 17, arrested in Lagos by security operatives, shortly after he arrived Nigeria from his base in the United Kingdom. He was subsequently arraigned before a Chief Magistrate Court in Abuja ‎over allegation that he engaged in‎ criminal conspiracy, managed and belonged to an unlawful society. ‎ In the First ‎Information Report, FIR, it entered before Chief Magistrate Shauibu Usman, FG, aside accusing Kanu of indulging in criminal intimidation, contrary ‎to section 97 (a)&(b) and section 397 of the Penal Code, maintained that it has evidence that he was involved in terrorism financing. ‎ Meanwhile, Kanu on October 19, pleaded not ‎guilty to the charge and was eventually ‎granted bail to the tune of N2million. The court further directed the defendant to produce a civil servant of Grade Level 16, to stand as his surety. However, the accused person alleged that the Nigerian government refused to release ‎him from detention despite the fact that he met the bail conditions.‎ ‎ ‎Moves by Kanu’s lawyer, Mr. ‎Egechukwu Obetta, to enforce the bail granted to his client by the Magistrate Court was thwarted by the DSS which applied to withdraw the charge upon which the bail was granted. 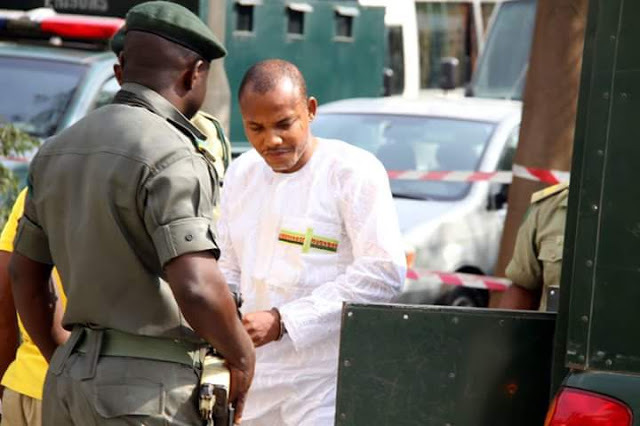 The DSS, in its notice for discontinuance, asked Magistrate Usman to ‎hands-off the matter, saying it has concluded plans to file fresh charge against Kanu before a higher court that has the jurisdiction to try terrorism case. Consequently, the Magistrate court, on Wednesday, struck out the charge, even as it discharged Kanu. Kanu had in his fundamental right enforcement suit, prayed the high court to set aside the order it made ex-parte, on November 11, in Suit No. FHC/Abj/CS/873/2015, which gave the DSS leave to further detain him. ‎ He applied for,‎ “An order of court admitting the applicant to bail and directing the respondent to comply with the order of the Chief Magistrate Court, Wuse Zone 2, Abuja, admitting the applicant to bail in Suit No. Abj/CMC/CR/21/2015, between the State Security Services V. Nnamdi Kanu”. Kanu’s lawyer contended that FG failed to adduce any evidence to support its allegation that Kanu is a terrorist, supports and finances terrorism and is preparing to take arms against the Nigerian state. “The continued detention of the applicant in the face of an ord‎er of a court that he be released is a trespass on the person of the applicant and a violation of the basic freedoms of the applicant as guaranteed by the constitution of the Federal Republic of Nigeria, 1999, as amended. “Section 27(1) of the Terrorism (Prevention) (Amendment) Act 2013 and any provision of that Act which empowers the court to make an order for the detention of the applicant or anybody else anytime beyond 24 hours without trial is ultra vires the constitution of the Federal Republic of Nigeria, 1999, as amended”, Kanu’s lawyer added.